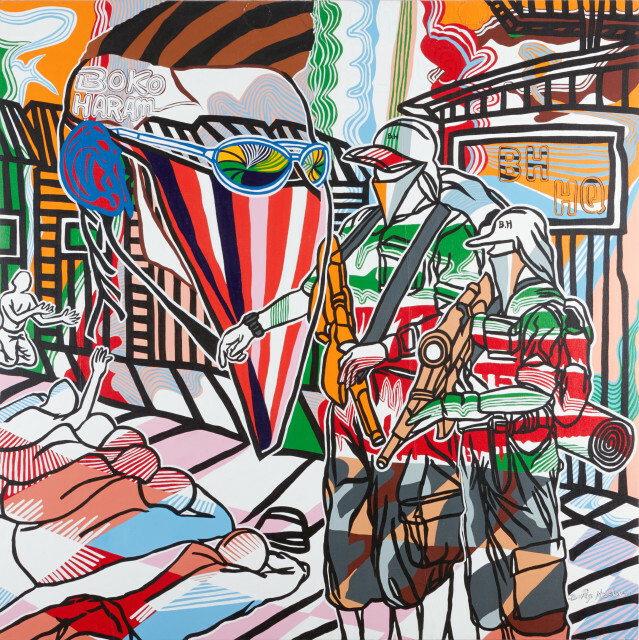 Jack Bell Gallery is pleased to present a new series of paintings by contemporary artist Boris Nzebo. In the artist's fourth solo show with the gallery, he addresses diverse themes of war, violence, politics, corruption and terrorism which continue to plague his local environment. ‘Ne Tirez Pas’ coincides with Nzebo’s current solo exhibition at the Manchester Art Gallery, entitled ‘Urban Style’. Born 1979, Port-Gentil, Gabon, Nzebo lives and works in Douala, Cameroon. His work has been exhibited in ‘Pangaea: New Art From Africa and Latin America’, Saatchi Gallery, London, 2014, & 'Pangaea II', 2015.